Each vial contains ceftazidime <?xml:namespace prefix = st1 ns = "urn:schemas-microsoft-com:office:smarttags" />1g (as pentahydrate). Whenever possible, it is recommended that the results of bacterial cultures and susceptibility tests are known before commencing treatment. This is especially important if ceftazidime is to be used as monotherapy. Ceftazidime should be used in combination with an additional antibacterial agent(s) when treating infections that are likely to be due to a mixture of susceptible and resistant bacterial species. Ceftazidime is almost exclusively excreted by glomerular filtration and the dose should be reduced when the glomerular filtration rate (GFR) is less than 50ml/min. * These values are guidelines and may not accurately predict renal function in all patients especially in the elderly in whom the serum creatinine concentration may overestimate renal function. In patients with renal insufficiency and severe infections, especially in neutropenics, who would normally receive 6g of ceftazidime daily were it not for renal insufficiency, the unit dose given in the table above may be increased by 50% or the dosing frequency increased appropriately. In such patients it is recommended that ceftazidime serum levels should be monitored and trough levels should not exceed 40 mg/litre. In children with renal insufficiency the creatinine clearance should be adjusted for body surface area or lean body mass and the dosing frequency reduced as for adults. The serum half life of ceftazidime during haemodialysis ranges from 3 to 5 hours. The appropriate maintenance dose of ceftazidime should be repeated following each haemodialysis period. For patients in renal failure on continuous arteriovenous haemodialysis or high flux haemofiltration in intensive therapy units, it is recommended that the dosage should be 1g daily in divided doses. For low flux haemofiltration it is recommended that the dosage should be that suggested under impaired renal function. Ceftazidime may also be used in patients who are undergoing peritoneal dialysis and continuous ambulatory peritoneal dialysis (CAPD) at a dose adjusted according to renal function. In such patients, a loading dose of 1g of ceftazidime may be given, followed by 500mg every 24 hours. 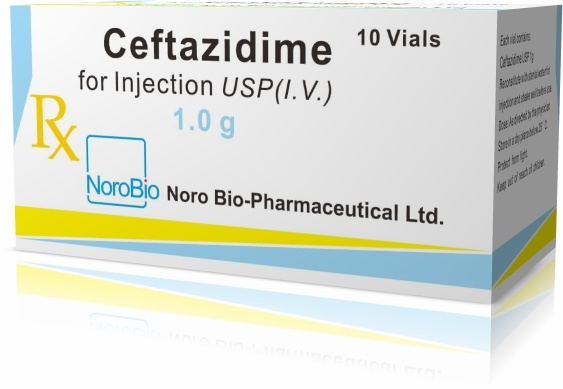 In addition, for intra peritoneal infections, ceftazidime can be incorporated into the dialysis fluid (usually 125 to 250 mg for 2 L of dialysis fluid). No dose adjustment is required unless there is concomitant renal insufficiency. Ceftazidime may be given intravenously by slow bolus injection over a few minutes or by deep intramuscular injection into a large muscle mass, such as the upper outer quadrant of the gluteus maximus or lateral part of the thigh.